Huge, intense aroma of espresso, dark chocolate, and slightly burned fruitcake. Slightly viscous on the tongue, initially sweet, but with an enjoyable bitterness emerging. It smells wet. There is no better way to explain it. Not a big nose, with subtle chocolate notes. The beer is very thick, though. But that’s okay… most stouts, especially imperial stouts, are meant to be dessert beers. There is no way you could drink one more of these beers. This beer is actually a Russian imperial stout… I am not sure what that means, but we shall see. The beer is good. I would buy it again, mainly because they are cheap. Cheaper than most beers in a bottle this size. I actually like their brown more than this. But it’s thick and black, and would go well with a nice cigar or meat based meal. Man… I wanted it to be so much more. As we move along 1001 bottles… I am sure I will be let down time and time again! Bottoms up people! 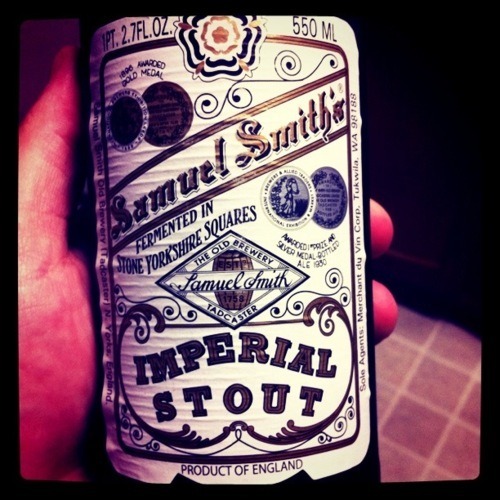 Tonight’s beer is the Samuel Smith Imperial Stout. I picked this one out, partially because it was the first one I saw in the fridge, but also partially because of my affinity for dark stouts and porters. And it’s an imperial stout. That usually means even yummier than a normal stout. And yes, I just used “yummy” to describe a beer. The imperial stout poured out as a thick black color. Yep, it’s pretty much black. And very thick – so thick it sits like oil in the glass, you can’t see through it even when held up to a light. It had a bit of a tan, brown color head. The smell is fainter than I expected, but still there when I stick my nose in the glass. It smells chocolatey and a bit like coffee. Bottoms up… let’s see what it tastes like. Very thick and heavy. The chocolate taste is definitely there, even in the aftertaste – it’s almost like drinking a dark chocolate beer. I like this better than Young’s Double Chocolate, I think. It has a smoother taste, one I can sit and drink even when it’s cold. I like it. Something I could have for dessert at home, but not a sipping beer in the summer, really. But it’s definitely my style – I’d buy it again, but probably only for a special occasion.